How far ahead of time should I book a charter? Plan your charter as early in the season as possible to get the best availability of boats, charter dates and lodging in the area. 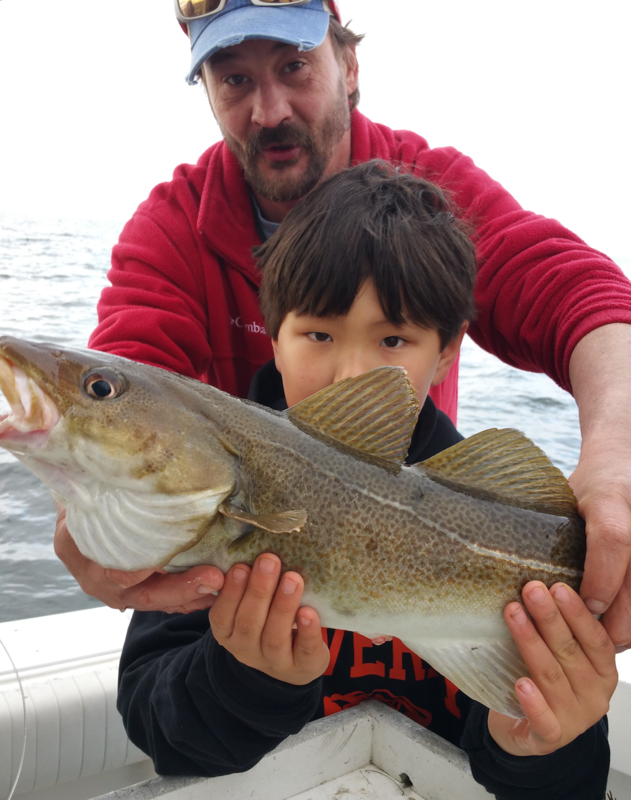 Ground fishing trips can normally be accommodated with 2-4 weeks’ notice and many times less. For Giant Bluefin Tuna we recommend 2 months or more in advance if possible. If you have a specific captain and boat in mind we recommend booking in April or May. This is especially true if you wish to book the entire boat. In fact, we start booking Tuna Charters as early as February. People who have been here before realize that July, August, September, and October are the most desired charter months and Gloucester’s busiest tourist months. 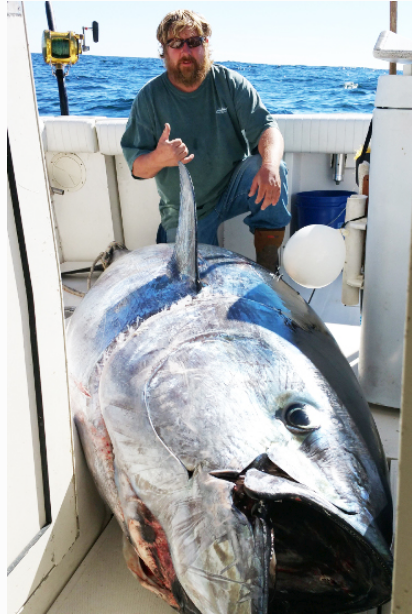 These months are the best for Tuna Charters because of the historic migratory run of the giant bluefin tuna. 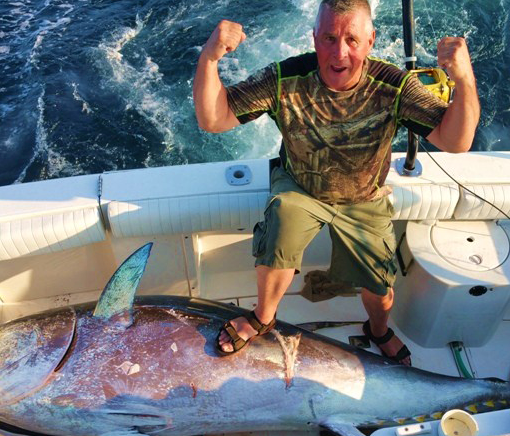 Veteran fishermen book their charters early to increase their chances of catching a giant bluefin tuna by securing their desired dates. Considering the overwhelming response from our nationally advertised commercial and ‘word-of-mouth’ recognition, we suggest that you secure your charter and local lodging by booking your desired dates at the earliest time possible. First, feel free to call us to discuss things that will help you in determining best time to come, type of charter to request and how many people you may want to invite. We can give you open dates or you can let us know how many people are coming and what date(s) you prefer. Once we have confirmed a date and boat we will require a 50% deposit to hold that date and will mail or email you our welcome package with the confirmation. The remaining 50% will be due by or before 14 days in advance of your charter date. The kind of fishing you are seeking also will help us determine the best Captain and Fishing Vessel combination for you. You can’t go on an overnight trip in a center console boat any more than you can easily fish the flats in a large sport fisherman. Being as specific as possible to the kind of fishing you want to do, the size of your group will help make sure you’re in the right boat for the trip you are planning. I don’t have enough people to book a whole boat? We often have 1-3 people who cannot fill out one of our 6-person private fishing vessel charters but want to get out on an off-shore adventure. Just call us! You can let us know what you are looking for and we most likely already have similar anglers seeking the same trip to help fill up the boat. We also have a mailing list you can join to receive a weekly update in what we call VIP Ride-Along Trips where we combine like-minded anglers to fill a great day! Like any reservation, the deposit confirms your commitment to the date(s) chosen so that we remove that date from our available calendar. In addition, the rationale behind the practice is that our captains and boats have payments and bills all year long, yet our charter season is at best 7 months and more likely 6 months. When we take a deposit for one of our captains on the off-season they are most likely using the deposit to prepare the fishing vessel for a safe, efficient and fun season ahead. Also, there have been times that people did not show up for their charter and the captain could have booked that date with someone who would not cancel. Remember, under the current fishery management plan, we only have a given number of days to fish each year and if we miss one of those dates it is hard to make it up in the off season. How can I avoid getting seasick? Becoming unexpectedly ill as a result of seasickness is always a possibility. In one form or another, it is possible for anyone on the trip to feel sick, even on calm waters. It can happen to anyone. If you have a tendency to get seasick or suffer from motion sickness, we strongly recommend you consider a prescription patch for the trip. At a minimum, we recommend that you take over the counter medication like Dramamine, starting the night before your trip. It does little good to start taking these over the counter medications once you are feeling queasy. Be sure you carefully follow the instruction label for taking an over-the-counter medication to ensure sufficient dosage. The dosage is typically calculated for a 150-pound person. What you eat and drink before and during a trip is crucial to avoiding seasickness. Typically, bland, easily digestible food is best. Pass on the predawn bacon, egg and cheese sandwich! Minimize alcohol consumption the day and night before as well as on the boat. Getting sick will definitely ruin your day and can make the trip unpleasant for the other guests; so, we urge you to err on the side of caution. What are the dock and departure times? Unless otherwise agreed upon, fishing charters depart from Cape Ann Marina, 75 Essex Ave. Gloucester MA. Check with us ahead of time (if we haven’t already let you know) to know the slip number. The time for departure is dependent on the type of charter and the time of year. Typically, Please confirm your charter departure time and plan to be at the dock at least 15 minutes prior. In general ground fishing charters leave at 6am and tuna charters at 4am but that can vary depending on preferences of charter guests and weather. Cancellations received and verified 21 days or more prior to your trip are fully refunded less an 15% administration fee. If you cancel less than three weeks before the charter, your deposit is non-refundable. However, we will try to rebook that date and if we are able to we will provide a credit for a future comparable charter. To reschedule the above holds true and we will make all attempts to rebook your trip based on vessel and captain availability. Life on the sea is always dictated by weather conditions for your safety and for providing an adventure that will give you the greatest chance of landing fish. Should the captain determine that the weather and seas are too rough for your charter to go out you will be offered the option of rescheduling within the next 12 months. Often, we can get you out within the days you are in town. If not we will book you for a future date or give you credit toward a future date. In the event that rescheduling is not a possibility, you will be refunded the full amount of what you placed down minus a 15% administrative fee. Should you decide to come back this fee can be applied to your next trip. Rain is not considered a reason to cancel a charter, and vessels will sail on a rainy day. What do I need to bring on the boat? The boat and captain will provide all the rods and reels, bait and tackle, ice and any other gear required for that charter. For the best experience, you should bring along food, drinks (soda, water, juice and beer/wine) and appropriate clothing. Remember that it is cooler on the water than it is on land so make sure you have warm clothing, rain gear, waterproof non-skid boots or shoes and even a change of clothing – especially if you will be out overnight. Things such as sunblock, sunglasses sun visors, chapstick and hand warmers can all make the trip more comfortable for you. We have plenty of room to stow your gear. You will want to have a cooler full of ice in your car to take your fish home as well! Should you wish to bring your own gear you are welcome but bear in mind you are solely responsible for its care and storage. Can I bring alcohol on the charter? Light consumption of beer and/or wine is allowed and part of the fun for some groups. But keep in mind that hard alcohol and drugs are strictly prohibited. We have zero tolerance for hard alcohol or drugs. Violators charter will be canceled, without refund. What amenities can I expect on the boat? Each of our Fishing Vessels is slightly different but all contain a basic head (toilet) and many contain a full head (full bath with shower), bunks for overnight sleeping, galley, and salon. Some boats have enclosed Flybridges and some have Captains helm on level with the fishing deck. All our boats are equipped with the proper safety gear, insurance and tackle. Need more information, call us to book your custom charter. All ground fish are yours to keep subject to federal per person catch limits. 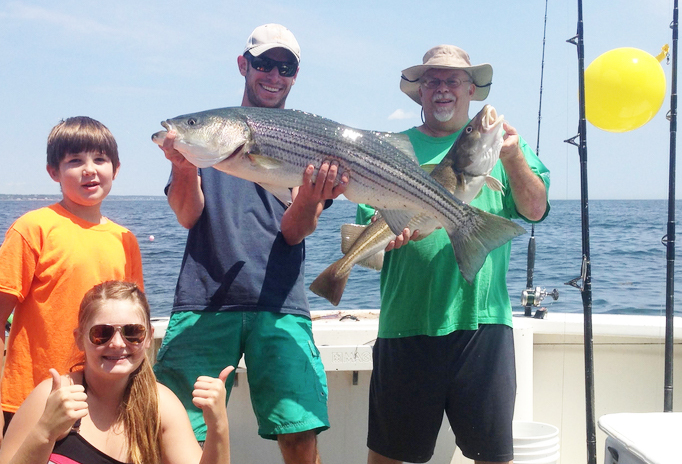 Our captains will clean, fillet and bag your fish for you to take home. School, large school, medium and large medium tuna may only be retained if federal regulations allow. Federal regulations change from year to year, and often change within the tuna season. For the latest NMFS Bluefin Tuna regulations, see the NMFS HMS Permits shop at http://hmspermits.noaa.gov/news.asp. Tuna over 73 inches must be retained by the boat. While this may seem counter to your charter, remember that this is how our fishing vessels make their money and pay for their boat and family. You are part of eco-tourism adventure while helping maintain valuable tuna stock and our local fishing industry. But there are many advantages to catching a Giant Bluefin Tuna besides the extremely valuable meat. We will do our best to help you photograph and video your adventure to share with family and friends. We will do our best to ensure you have any ground fish and lobsters caught during the trip to take home. Tuna under the federally mandated limit are yours to take home per allowable regulations. For the latest NMFS Bluefin Tuna regulations, see the NMFS HMS Permits shop at http://hmspermits.noaa.gov/news.asp. 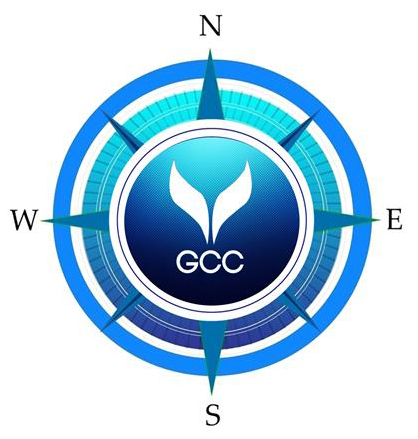 Gloucester Charter Connection is the Northeastern US representative of Gray Taxidermy, the largest marine taxidermist in the world. When you catch your trophy fish with us, Gray’s can create an amazing, lifelike replica that you can mount on the wall in your home or office and brag about to friends, family, colleagues and anyone else! Imagine re-telling the story of the fight between man and fish to your guests. Finish with a finale that includes revealing your trophy mount in all its shining glory! No dedicated angler’s home is complete without a one of a kind mount from Gray Taxidermy.